Hey guys! I saw something online tonight that bugged me a little, and I decided to write about it because why not? Anyway, I'm not the greatest writer when it comes to persuasion and rhetoric, but I'll give it a shot. 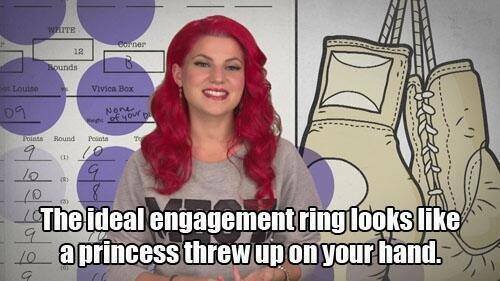 Have you ever seen that TV show on MTV called "Girl Code"? That horrid, awful show? I have, and upon first watch I actually thought it was funny. I thought,"Hey, this is great, MTV is airing a show that promotes female individuality and speaking out against what society has deemed feminine. Cool." 1. The idea of a girl code or a guy/bro code is completely bonkers. Who deemed at some point 50 years ago that an unspoken set of rules should underly EVERY WAKING DECISION OF AN ENTIRE GENDER'S LIFE. Like, what? The idea of an underlying code that should dictate my actions as "cool" or "uncool" or bad or good or totally not okay or righteous man is a supposed liberal way of saying that I belong in this group, so I best not step outside of it. All right. I should be able to act on my feelings, regardless of my gender. The last time I checked, my genitalia does not determine my interests or personality. That derives from my genetics, my habitat, and least of all my gender. 2. This brings me to my next point: gender roles. Pink room, pink clothes, dolls and play kitchens, dresses, and eventually housewife. Sound familiar? I don't know if there has ever been a time that I've walked into a Toys R' Us and saw toys that weren't pink/purple/shiny/had to deal with beauty and the "ideal" life. The same goes for men. I'm not saying only women are the victims here; little boys are brought up on this unrealistic notion of masculinity that degrades anyone who steps outside the barriers of what's acceptable. What I noticed the most is that the show tries to be sarcastic and funny, which at times it can be (in cases of this Beyonce GIF I found. I lol'd) But what I find the most disturbing is its generalization about the female population as a whole. "Us" "We" and "Them" are common pronouns used to describe girls and how we should act or what we should like. The picture that bothers me the most is the one I put in the beginning of this post. 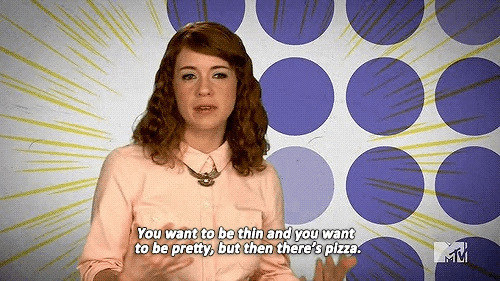 "You want to be thin, and you want to be pretty, but then there's pizza." This implies you can't be pretty if you're thin or you can't be happy if you're not thin and pretty. I know I'm probably reading a little too much into the semantics, but something about this really strikes a chord in me. The media has a complete stranglehold on the image of beauty and the self-confidence of millions of girls. If a TV show that is supposed to liberate women from this ideal is preaching the same ideas, how much better can it be than the rest of ads? I don't like how this show is meant to be a voice expressing such "taboo" subjects when in reality my generation has mostly gotten over. Like OMG girls like pizza?? I never knew that. GIRLS FART????? That's totes a lie. And it's not just the fact that they treat such mundane, every day things like they're incredibly awful to talk about, but it's the fact that they treat it with such contempt and pretentiousness. Does this resonate with any of you/make any sense? Comment down below with your thoughts! Love this. You're very articulate!